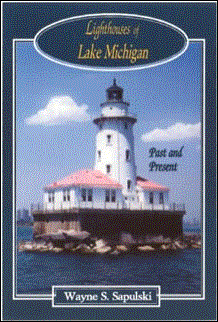 This stunning and comprehensive guide to the past and present lighthouses of Lake Michigan will delight and entertain everyone who has ever visited these glorious beacons. Filled with color photographs and rare historical pictures, this beautiful and meticulously researched compilation contains the navigational and architectural history of each light, the details of why and where they were built, their current status, and clear directions to the sites. Starting with St. Helena Island and moving clockwise around the lake to finish at Seul Choix Point, this well-organized guide will facilitate visiting the jewels of Lake Michigan. Photographer and historian Wayne Sapulski combines his spectacular modern photographs with an extensive collection of historical picture postcards and archival prints to create this striking site review. As a licensed navigation officer and later as an avid photographer, few people have traveled around the Great Lakes as extensively as Wayne Sapulski. He has been fascinated by ships and maritime history from an early age. Wayne began a career in health care, but his desire for adventure and travel that had lain dormant during college soon resurfaced. After graduation at the top of the Deck Officer Class from the Great Lakes Maritime Academy in Traverse City, Michigan, Wayne sailed as a U.S. Coast Guard licensed navigation officer (Third Mate) aboard several of the large freighters that ply the lakes. As a result of his training and experience, Wayne became an expert on aids to navigation on all of the Great Lakes and their connecting river systems. Several years after Wayne's sailing career ended, he was on vacation in Door County, Wisconsin, home to a high concentration of lighthouses. It was here that he realized he had seen many lighthouses from a distance offshore, but very few up close. From this his desire to photograph lighthouses emerged. He decided to travel to the remote corners of each Great Lake to photograph every lighthouse still in existence from water level, on Canadian as well as American land. Through great difficulty and perseverance, after eight years and 352 lights, he finally achieved his goal. During his research Wayne has amassed one of the largest collections of antique postcards and archival photographic views dedicated solely to the topic of Great Lakes lighthouses. Wayne's photographs and articles have appeared in a number of regional art shows and publications including Great Lakes Boating Magazine, Great Lakes Cruiser Magazine, Lake Superior Magazine and calendar, Lighthouse Digest Magazine, the State of Ohio's Lake Erie Office publications and Coastweeks Calendar, The Beacon (publication of the Great Lakes Lighthouse Keepers Association) and The Keepers Log (publication of the U.S. Lighthouse Society). He also coauthored and took all of the photographs for the popular guidebook Great Lakes Lighthouses, American and Canadian. Still licensed but no longer sailing, Wayne remains active in a number of maritime historical societies and lighthouse groups, especially the Great Lakes Lighthouse Keepers Association. A native of metropolitan Detroit, he presently resides with his family in Livonia, Michigan.